CD273-muIg/Biotin is functional in EIA as a detection reagent binding to plate-coated recombinant CD279(PD-1). Streptavidin/HRP was used as a secondary detector and TMB/H2 O2 as a chromagen/substrate. Human CD274-muIg fusion protein was Protein A purified from (low FBS containing) tissue culture supernatant of CHO transfectants, and reacted with NHS-Biotin. Unconjugated Biotin was removed from conjugate by desalting column. Store at 2 - 5 degree C. Freeze/Thawing is not recommended. Product should retain activity for at least 6 months after shipping date when stored as recommended. Small volumes of CD273 protein vial(s) may occasionally become entrapped in the seal of the product vial during shipment and storage. If necessary, briefly centrifuge the vial on a tabletop centrifuge to dislodge any liquid in the container`s cap. Certain products may require to ship with dry ice and additional dry ice fee may apply. Information: CD273 (B7-DC, PCDL-2, Programmed cell death ligand 2, Butyrophilin-like protein) is a type I surface molecule with homology to CD80, CD86, CD274. It is expressed primarily by Dendritic cells.and provides a stimulatory signal to CD279 (PD-1, Programmed Death molecule) which serves an important immunoregulatory role by down regulating T cell response. CD273 binds to CD279(PD-1) with a 2- 6 fold higher affinity than CD274(2). 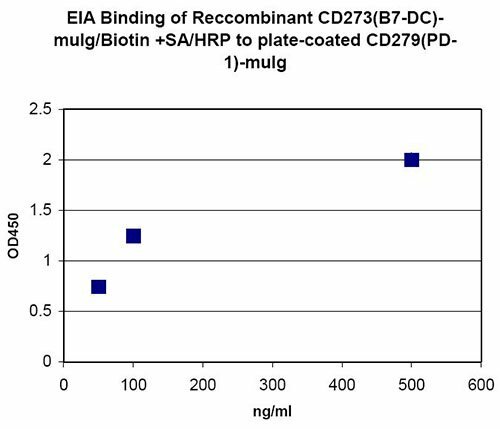 Recombinant CD273-muIg binds to recombinant CD279 in EIA. 1) E N Rozali, W J Lesterhuis, et al. (2012) Clin Develop Immunol 2012: 656340. 2) P Youngnak, H Konozo, et al. (2003) Biochemical and Biophysical Research Communications 307(3): 672-677.